Business opportunities take shape with incredibly detailed 3D specialty items Our 3D pieces will amaze you with the incredible attention to detail, you'll swear it's the real thing. 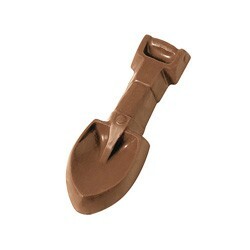 Ground breaking shovel or spade for promotional marketing and construction companies. Choose Milk or Dark Chocolate. Choose Gold or Silver Gift Box. Size : 1 1/2" x 4 1/4"
1 1/2" x 4 1/4"